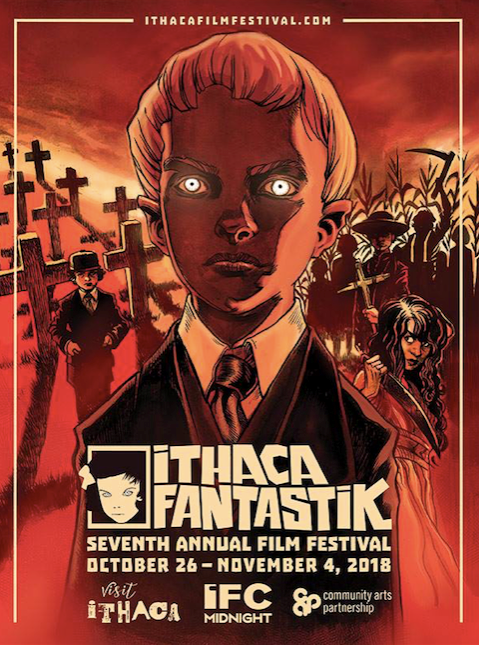 Ithaca Fantastik wraps 7th edition! Last Sunday, The Ithaca Fantastik film festival wrapped up another successful edition of genre programming, documentaries, events and guests in gorgeous Upstate New York. The 7th edition of the festival opened on October 26th at our long time main festival venue, Cinemapolis with Cristina Gallego and Ciro Guerra's critically acclaimed drug crime thriller BIRDS OF PASSAGE and closed on Sunday, November 4th with Victor Danell's Crazy Pictures feature, the Swedish disaster action drama THE UNTHINKABLE. For the second year in a row, the festival ran for ten days straight with returning programming blocks, International Competition, Cinema Pur and Midnighters as well as the new Documentaries, Throwback Thrillers and Down Under sections. In addition to film screenings the festival presented two art exhibitions: the visually enthralling collected works of Caroline Harrison, and a collection of works from various artists based around this year’s theme of difference and similarity in our age; and the FANTASTIK VR section which presented six riveting shorts that went from horrific to inspiring. The 2018 edition of the festival hosted films from 19 different countries and welcomed guests such as STARFISH director A.T. White; GIRLS WITH BALLS actress Anne-Solenne Hatte; Perry Blackshear, director of THE RUSALKA; BOILED ANGELS director Frank Henenlotter, producer Mike Hunchback and criminal indie comic book artist and subject of the film Mike Diana; and CAM actor Patch Darragh. We also hosted the very first DRUNKEN CINEMA projection in the US where spectators were invited to participate to an informal drinking game involving secret rules while watching an 80’s classic genre film. This year, the jury was composed of Yellow Veil Pictures co-owner Joe Yanick, programmer and producer Vanessa Meyer and the Archive co-owner and Vinegar Syndrome lead restoration artist Brandon Upson. Best WTF! Short: MOTHER FUCKER dir. Nicholas Payne, who was in attendance at the festival. Ithaca Fantastik would like to thank Cinemapolis, The Studio Ithaca College space, Ithaca College DKA Professional Cinematic Society Volunteers, Ithaca Underground, Community Art Partnership with their Grant for Art program, The Tompkins Country Tourism Grant Program, Angry Mom Records and our amazing audience!